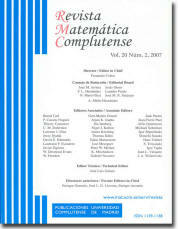 Revista Matemática Complutense is published under the patronage of the Universidad Complutense de Madrid. It was founded in 1988, with the name of Revista Matemática de la Universidad Complutense de Madrid. At that time, new issues were released every four months. In 1993 (volume 6), this journal became half-yearly. In 1998 (volume 11), it was renamed as Revista Matemática Complutense. At present, one volume is published per year, each volume divided into two issues. The journal publishes original research or survey papers in the following areas: Algebra, Analysis, Applied Mathematics, Astronomy and Geodesy, Computer Science, Geometry and Topology, and Statistical and Operational Research. Former editors-in-chief were Enrique Outerelo (1988–1995, founder), José L. G. Llavona (1996–1999), Enrique Arrondo (2000–2003) and Fernando Cobos (2004-2011).